One of my favourite cities, San Francisco is rich with history and culture, offering something for everyone. These are some of my favourite places to visit in San Francisco. Foodies should be sure to check out the bustling market in the Ferry Building for artisanal food and drink. Historic Pier 39, with its seals and sea lions, is also a great place to visit. Do wander through the Embarcadero area – there are shops and restaurants galore, as well as a very interesting fish market. Warm up with clam chowder in a sourdough bread bowl at Boudin, located at 4 Embarcadero Center. The famous St Francis Hotel looks over Union Square, a destination that offers discerning shoppers everything from Macy’s and Levi’s to Saks and Tiffany’s. 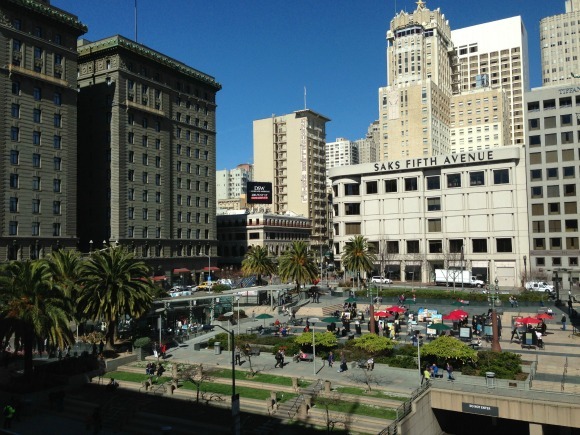 There is a Cheesecake Factory on the very top floor of Macy’s where in fine weather you can sit out on the terrace and overlook the square as you eat. Or dine at my favourite vintage diner, Sears Fine Foods at 439 Powell Street. Best explored on food, this neighbourhood is just up from Union Square. 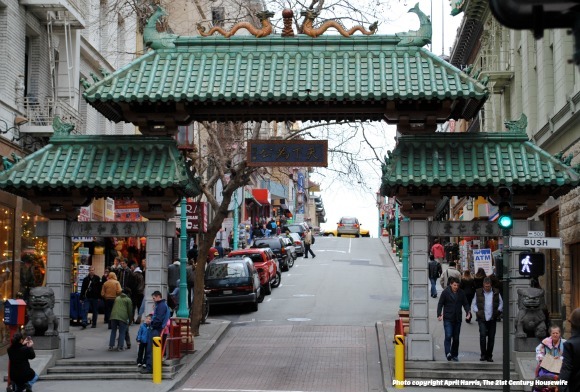 Centered on Grant and Bush Avenues, Chinatown is a great place to get a taste of San Francisco’s thriving cultural scene as well as some wonderfully delicious food. Centered on the intersections of California and Powell Streets, Nob Hill was the place to live until the 1906 earthquake when many beautiful mansions were destroyed. You can still see soot marks on some of the buildings from the fires. It’s still an affluent district and home to my two favourite San Francisco hotels, The Intercontinental Mark Hopkins and The Fairmont. The Intercontinental is the home of The Top of the Mark, a fabulous place for a cocktail with a view. Also, don’t miss beautiful Grace Cathedral and Huntingdon Park. This striking art deco tower on Telegraph Hill was built in memory of Lillian Coit, who left a legacy “for the purpose of adding to the beauty of the city which I have always loved”. Telegraph Hill offers wonderful views of San Francisco and the tower itself has very interesting murals inside. I have never travelled to the top of Coit Tower but apparently the views are even better. Originally a Spanish garrison and later an American army base active during both World Wars and the Vietnam War, the Presidio is now part of the National Parks Service. 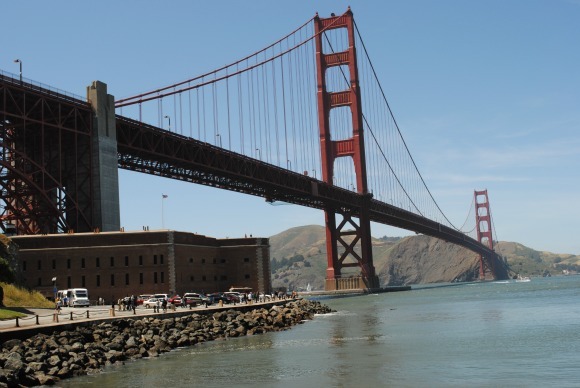 There are many historic buildings and museums as well as stunning views of the Golden Gate Bridge. With over 1,000 acres of gardens, playgrounds, lakes and picnic grounds, you could spend a whole day here. 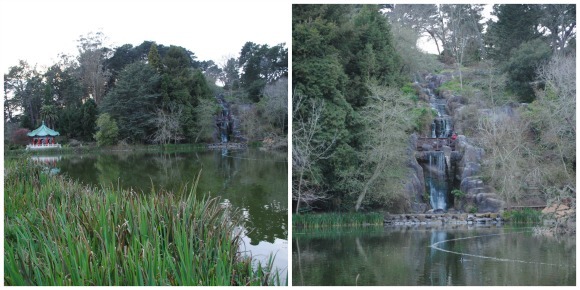 I particularly like Stow Lake with its lovely waterfall. It is quite an experience to drive, walk or cycle across this stunning piece of architecture. Just across the bridge from San Francisco there is a Vista Point with parking that offers amazing views back over The Golden Gate, as well as of San Francisco and Alcatraz. Driving across the bridge out of the city is free, but there is a toll for motorised vehicles to cross back towards the city ($7 for cars at time of writing). Although not actually part of San Francisco, Sausalito has lots of shops, galleries and a huge variety of restaurants. Just under six miles from the Golden Gate Bridge, Sausalito is a lovely place to spend a day. These are just a few of my favourite places to visit in San Francisco, a constantly evolving city which offers something new on virtually every visit! I love to leave the car near Sansome Street, at the bottom of the Filbert Steps which lead up to the Coit Tower: it’s great exercise to walk up, and the famous parrots of Telegraph Hill can often be spotted. My other favourite outdoor place is Crissy Field – we often park at Sports Basement on Old Mason Street, then walk out to the (Golden Gate) bridge beside the water. There is an ideally-placed cafe called The Warming Hut, which is always teeming! Although there are usually long queues to ride the Cable Cars, it always feels worth the wait. The free-to-visit Cable Car museum is small but interesting. Thank you so much, Pauline, that’s given me lots of inspiration for new places to visit! Love the walking tours – that’s a great link! I have fond memories of walking up to Coit Tower once. My son and I started from our hotel and by the time we got to the steps we were laughing as we were already so exhausted from the hills leading up to them 🙂 It was great exercise and I have some really fun pictures of the two of us. We were really happy when we got to the top! 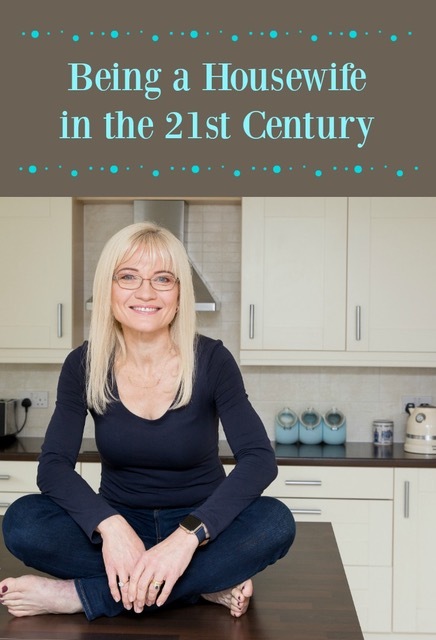 Would love to get to Santa Monica one day – it would be lovely to meet up! We always talk about driving along the coast but we keep running out of time. One of these days!! My friend lived in San Francisco for a while, and she visited so many places. It would be fun to explore with the whole family! It really is a cool city, Marysa. San Fran is my jam. I absolutely love hanging there with my friends when I can get out there. It’s so much fun! I’ve only had a day in SF to sightsee before. But we made sure to visit the wharf – it was amazing! It really is fun down by the wharf, Scott. I love the seals! One of our favorite family trips was to San francisco. We loved the variety of things to do. One fun place we discovered on the wharf was Musée Mécanique, super fun! So many great places to eat also. I haven’t been to the Musée Mécanique – we’ll have to check it out next time, Kristi! Oh my goodness, I’ve been several times to San Fran and I definitely go to these places. Fisherman’s Wharf being my fav. Can’t wait to go back.